The book on Customer Service & Banking Codes and Standards has been prepared keeping in view the syllabus for the Institute’s Certificate Course on the subject. The book has four modules while Modules A, B, and C deal with customer banker relationships, customer service, features of modern day banking, KYC norms, customer grievances redressal policy, Module D deals with the establishment of the BCSBI and elaborates on the codes dealing with the customers and micro & small enterprises. An efficient and effective customer service is of vital importance in modern day banking. The task becomes all the more challenging as the expectations of the customers have seen paradigm shifts in the recent past. Customer service calls for appropriate soft skills and also a good knowledge of the banking products and processes. IIBF believes that education plays a crucial role in improving the skill sets of bankers. It is our belief that in addition to the financial education of customers, there is a need to equip the bank staff with appropriate knowledge on customer service. 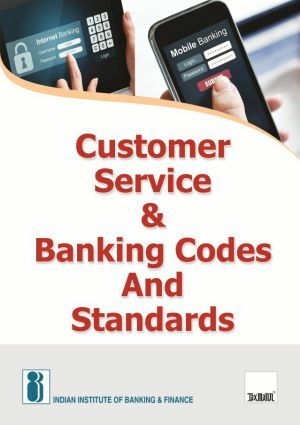 This course material on Customer Service and Banking Codes has been designed and developed by IIBF with active support from the Banking Codes and Standards Board of India (BCSBI). The courseware is expected to equip the practicing bankers to put on ground an efficient customer service.